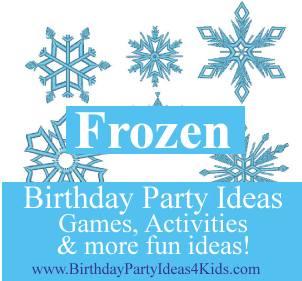 Our favorite ideas for a Frozen birthday party theme for kids ... all wrapped up on one page! Fun unique party games, activities, ice breaker games, party favor ideas, goody bag and decoration ideas! All of our ideas are budget friendly ... just mix and match the ideas that work the best for your party and kids. These Frozen themed party games are fun for kids of all ages! This is a fun and easy party game and kids love playing it. You will need several rolls of toilet paper (snow)- all the same brand and # of sheets. The object of of the game is to see which team of kids can make one of their team members into a snowman first by wrapping them in the "snow" (toilet paper) . To set up divide party guests into groups of 2 or 3 and give each team a roll of toilet paper. If the teams have 3 people each then one of the team members will be wrapped by the other 2 members of their team. Each team group gets a roll of toilet paper for each person who will be wrapping. Let the teams choose who will be wrapped first. On "go" the kids who are wrapping will give the end of the toilet paper to the person being wrapped and they will hold the ends in their hands. They then wrap their toilet paper around and around until they are out of paper and the person being wrapped is covered from head to toe. 1st group to empty their rolls of toilet paper yells "Snowman" and wins! Before the party hide lots of cotton balls around the party area. When it's time for the game gather the guests and tell them that there has been snow hidden around the party. Then let the party guests search for the cotton balls. For fun you can have special cotton balls that are colored blue and the guests that find them are rewarded a bigger prize. After all the snowballs have been collected let the partygoers turn them in for small prizes or candy. Teams race to move their "snow" from one side of the room and back. For each team you will need cotton balls, ping pong balls or large foam peanuts and a broom. (Ping pong balls are the most fun! Make sure each player has to move at least 3 at a time ... the more you add the crazier it gets! ) Give each team the same number of items of "snow" and a broom and have them one at a time race to the other side of the room and back while herding their "snow" with the broom. This game works best on a floor with a hard surface such as wood or tile. If the kids are older set up a fan at the opposite end of the playing field to make it more challenging. The first team with all members completing the task wins. Blow up white balloons half way and tie a string, about 18" long, on each balloon. then tie the other end of the string to the ankle of a party guest. When everyone at the birthday party has their "snowball" attached to their ankle an adult yells "Snowball Stomp!" and the kids will try and stomp and break the other children's balloons while trying to protect their own. Give winners and participants small prizes or candy. You’ll need a new roll of toilet paper (snow) for this icebreaker. Have the party guests sit in a circle and tell them you are going to pass around some snowflake sheets. While guests are arriving at the party have them guess how many snowballs are in a large jar. Write down their guess and their name on cards. The party guest who's guess is closest to the number in the jar wins the whole jar and it's contents! Fill the jar with your choice of snowball items such as white cheddar cheese balls, blue gum balls, snowcap chocolate candies, white marbles or cotton balls. Be sure to count the items as you are filling the jar before the guests arrive and write down the number. Make snowflakes from different colored blue, purple and white paper. Experiment with different weights and types of paper such as tissue paper, crepe paper, scrapbook paper and copy paper. Glue to a piece of black or dark blue poster board and let the kids take home their creations. Here are a few fun decorating ideas for a Frozen party ... mix and match the ideas that suit your party and budget. Decorate with strings of white Christmas lights ... over the entrance to the party, staircases, mantles and on the party table. Use blue and white sidewalk chalk and draw a blizzard of snowflakes on the sidewalk and walkway to the party. Cut snowflakes out of paper and hang them up on the ceiling with fishing line. Fill silver metal containers or pretty glass containers with blue and white snacks and candies. Blue or white bottles of bubbles - take off the labels and replace with a label that says "Thank you for coming to _______'s party!" We have birthday party themes and ideas for kids of all ages! 1, 2 and 3 year olds, 4, 5 and 6 years old, 7, 8, 9, 10, 11, 12 and also tween and teen party ideas!